For one, Carl Icahn likes to curse (though the network managed to bleep him out), and he thinks Ackman is a "liar," a "major loser," and a "crybaby in a schoolyard." In case you didn't know it, Icahn made it crystal clear that the two are "not friends." What we still don't know: Has Icahn actually purchased shares of Herbalife as press reports have said? He wouldn't say. Ackman had his share of insults for Icahn, calling him a "bully" who "takes advantage of people" and "not an honest guy." But he kept it a clean fight (translation: no cursing). The Icahn-Ackman battle has quickly overshadowed the other duel involving Ackman and Third Point's Dan Loeb. Just two weeks ago, Loeb revealed a new 8% stake in Herbalife and praised the company's management. Icahn did say that someone could make a tender offer for Herbalife, which would be the "mother of all short squeezes" for Ackman and his $1 billion bet against the company. 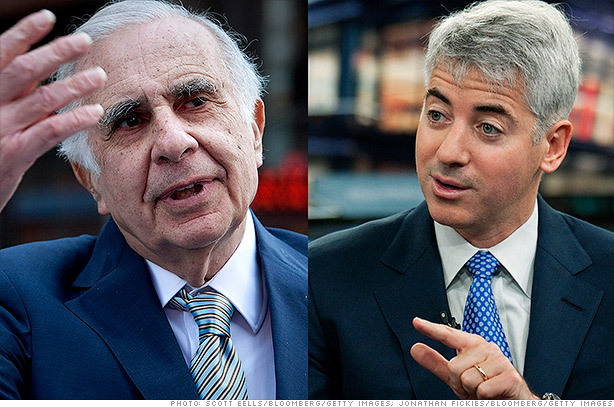 Ackman taunted Icahn to go ahead and do it. I think it would be quite funny if Carl Icahn tries to bust out Bill Ackman, by making a tender offer for $HLF Carl does have the money..
Ackman and Icahn didn't try to sing or rap on CNBC. If I was Icahn, I am on the phone to Warren Buffett talking $HLF buyout. They can spin it off to private equity after they squeeze Ackman! By the end of the trading day Friday, Herbalife was the winner of the duel. Its stock closed up nearly 1%. After falling more than 35% when Ackman called it a pyramid scheme, Herbalife's stock is now back above pre-Ackman levels.